Between October 22 and November 2, British Columbians will receive a ballot package in the mail from Elections BC asking us if we want to change from our outdated voting system to a new way of voting called Proportional Representation (or ProRep). ProRep will make all of our votes count by ensuring that our legislature will accurately reflect how we vote; if a party’s candidates win 40% of the vote, that party will end up with 40% of the seats. There are many excellent reasons why you might want to vote for this change to ProRep. If you’ve ever felt it’s unfair that a party with under 40% support can seize the reins of executive and legislative power and start doing whatever they want without regard to the 60+% of voters who oppose their actions, then now is your chance. If you’re worried that people with deep disdain for democracy can come to power without anything close to true majority support and run roughshod over our core democratic institutions, as Doug Ford has recently been doing to our Charter in Ontario and as Donald Trump has been doing down south, then now is your chance. If you’ve ever felt you would be throwing your vote away if you voted for your true top choice, and instead ended up holding your nose and voting for a person or party just to stop someone you truly feared from getting in, then now is your chance. If you live in one of the 60 or so ridings in BC which are so safe for one party that, in Rafe Mair’s inimitable words, “a fencepost with hair” could win if it had the right party label, then now is your chance. If you’re tired of seeing whole regions of the province swept by one party or another, leaving some areas entirely without representation in government, and if you’re frustrated that you don’t hear MLAs from different party backgrounds actively debating the most pressing issues in your region, then now is your chance. 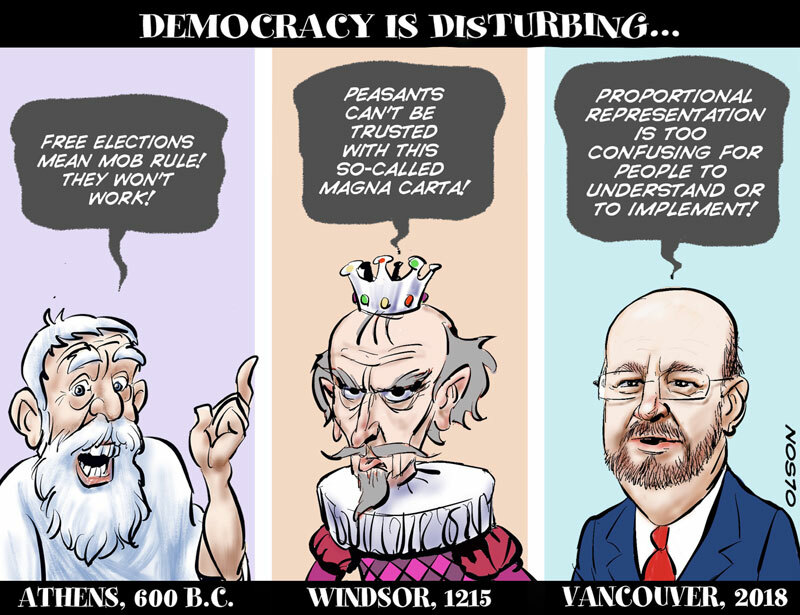 If instead of the same old tired, divisive, polarizing politics and partisan bickering, you think BC would be a better place if we used a new way of voting that included a wider range of voices, that empowered MLAs to represent your areas’ issues to Victoria instead of the other way around, and that encouraged MLAs to cooperate across party lines, then now is your chance. If you want us to vote in a way that has helped eight OECD countries to overtake Canada in the UN Human Development Index over the past 25 years, then now is your chance. If you want us to choose a way of voting that makes young people enthusiastic about voting, then now is your chance. And if you want BC to be the leader in showing North America how a more inclusive approach to democracy can make our society better in just about every way imaginable, then now is your chance. The official opponent, the No BC Proportional Representation Society, is a triumvirate of political insiders: Suzanne Anton, a former Liberal cabinet minister, Bill Tieleman, a former NDP strategist and Bob Plecas, a retired senior civil servant. As Press Progress recently reported, the opposition to ProRep is largely funded by BC’s wealthiest people and our province’s entrenched power brokers. Some of the major donors to date include a mining tycoon, a venture capitalist, the billionaire founder of Future Shop, a corporate lobbyist, several developers and realtors, and six separate members of the Rogers dynasty. And a lumber tycoon apparently personally funded front page ads on newspapers across BC prior to the official start of the campaign. Opponents are pulling out all the stops. They have no qualms about resorting to misinformation and flat out lies. Some of these are almost laughable; the Independent Contractors and Businesses Association used a horror show theme to try to scare us about the fact that Australia’s government caucus recently forced the prime minister to step down, suggesting that this is our fate if we adopt ProRep, despite the fact that Australia doesn’t even use ProRep for its lower house. But some of their activities are more sinister. Opponents are being investigated by Elections BC for running illegal ads. And BCTV Kootenays recently reported that a new Fact Checker website was apparently subjected to a cyberattack within two days of its launch. So she urged voters to support ProRep, saying, “If the established interests succeed in defeating this, they won’t give you another chance. I hope British Columbians take this chance for real change.” However, once politicians taste power, they change their tune, as Prime Minister Trudeau famously did a couple of years ago in cancelling the federal reform process. In Clark’s case, when reminded of her 2009 recording, she categorically denied it, saying, “I have never supported [proportional representation]”. So with all these entrenched and vested interests opposed to voting reform, we have to do everything in our power to make our voices heard. And the most important way to do that is to vote for ProRep on the first question on the ballot. Which systems should you choose on the second question? It’s really up to you. All are solid choices. You might prefer rural urban if you want the system that is closest to what the BC Citizens’ Assembly recommended. You might prefer mixed member if you want to keep having single member ridings, but also want to elect some MLAs at a regional level to provide a wider range of voices in your region. Or you might prefer dual member if you like the mixed member model, but want to be sure that one of the regional MLAs comes from your part of the region. Whatever you choose, each of them will strengthen our democracy and put people ahead of the power brokers who have had undue influence on our government for far too long. And each of them will ensure that the proportion of seats a party gets will equal the proportion of the vote their candidates receive in an election, all across the province. This fall’s referendum gives us an amazing chance to vote for a better way of electing our government. By voting for ProRep on the first question, we can get rid of our tired status quo system. And with the second question, you can also help choose the kind of ProRep we get. ProRep will be a new way of voting that we are confident will work better for you. Make your vote count – in every election. Vote for ProRep and enjoy getting what you vote for. Antony Hodgson is President of Fair Voting BC and of Vote PR BC – the official proponent in this fall’s referendum. He has been advocating for electoral reform since the original BC Citizens’ Assembly on Electoral Reform back in 2004. In his day job, he is a professor of biomedical engineering at UBC. For this change to a more positive and inclusive politics to actually happen, you need to do something very important. When Elections BC sends you your ballot package later this month, you need to vote for ProRep and send your ballot in, as soon as possible, and then invite and encourage all your friends and family to do the same. The defenders of the status quo are determined to block change. There are people in this province with strong vested interests in the current disproportional and dysfunctional voting system who don’t want voting reform to succeed, and they’re working very hard to make sure this referendum campaign does not succeed. When and how do I vote? Elections BC will be mailing out the ballots starting on October 22, just after the municipal elections. Ballots must be RECEIVED by Elections BC by November 30 so please be sure to mail yours back well in advance to be sure it will count. The first thing to do is to make sure you’re registered to vote and that Elections BC has your current mailing information. You can update your information at https://elections.bc.ca/register-to-vote. If you’re going to be out of town during the referendum, Elections BC can send your ballot to an address of your choice. What are the questions on the ballot? There will be two questions on the ballot. The first one simply asks if you would like to change to a proportional voting system. We strongly recommend you vote for ProRep on the first question. The second question asks for you to rank your preferences regarding three proportional voting system options that the Attorney General has identified as being suitable for use in British Columbia. All three options are based on previous electoral reform processes and all would be excellent choices for BC. All would deliver strong proportionality, no region would lose any MLAs and voters would be able to vote for individual candidates. EDITOR’S NOTE: All three proportional representation ballot options are fairer and more proportional than the current First Past the Post system. It is time to improve our democracy. I want to post this article on FB-and share-I don’t see a way to do this.Please advise. Are you able to see the Facebook button at the start of the article?